David Kotok, co-author of "Adventures in Muniland," and Matt Fabian of Municipal Market Analytics counsel muni bond investors on what to watch out for. 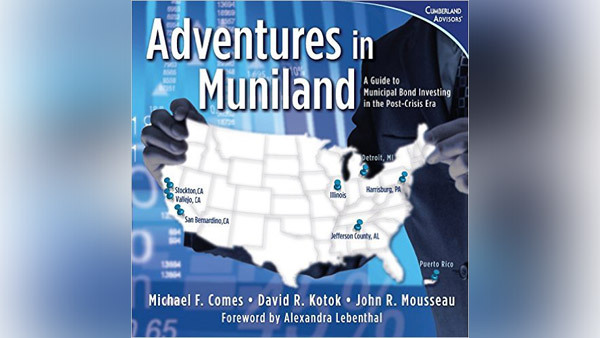 "Adventures in Muniland" by Michael F. Comes, David R. Kotok and John R. Mousseau. When the government of Puerto Rico missed most of a $58 million debt payment a little over two weeks ago, it tainted the municipal bond market, but not nearly as much as some had expected. Even the muni bond funds that held 30% or more of their assets in Puerto Rico bonds barely moved on the news. That resiliency coupled with relatively high yields suggest that munis now are a good buy for investors, especially those in high tax brackets. Usually municipal bonds pay less interest than Treasuries because their interest payments are tax exempt, providing investors with even more after-tax income. Issuers therefore can find ready buyers paying lower relative yields. An investor in the top 39.6% federal tax bracket, for example, would collect 6.62% interest on a 4% muni bond, and that’s after accounting only for federal income taxes. If state and local income taxes were included in the calculation, the tax-equivalent yield would be even greater for many investors. “It’s a good time to buy munis,” says Matt Fabian, partner at Municipal Market Analytics, an independent research firm focusing on the muni market. Even though interest rates are expected to rise, which would depress the price of all bonds, including munis, “long-term growth will be slower than in the past so rates are not likely to rise all that much,” says Fabian. And when rates do rise, “munis should do better than taxable bonds” because the higher yields will cushion the price declines, he says. A bigger risk for muni investors may be the credit risk of the issuer and, by extension, of the muni mutual funds or ETFs that own those bonds. “Muni bonds are one of the sectors that hasn’t healed since the financial crisis,” explains Kotok. He advises investors to “watch the credits and the structure of the bonds” they buy and look beyond the usual analysis. “Be careful about debt issued by cities. Look at the property values and income, migration, crime rates against people and property. … Most governments pay [interest] most of the time and don’t issue restatements like corporations in the business world do, but you can get government failures.” One recent failure, in addition to Puerto Rico: the state of Illinois, which has been operating without a budget for seven weeks because of differences between the Republican governor and Democratic state Legislature. As a result of the political impasse, Chicago’s Metropolitan Pier and Exposition Authority, which runs the nation’s largest convention center, missed a debt payment last month, leading to a seven-notch credit downgrade by Standard & Poor’s. The legislature ultimately overrode the governor’s veto, restoring funds that will service the debt. “In the past, rating agencies rated the economics of a muni bond issue. Now they are incorporating on actions of government,” says Kotok. In other words, now they’re watching the politics as well. Kotok and Fabian counsel against investing in muni debt from Illinois (including Chicago, whose bonds are junk-rated by Moody’s) and New Jersey. Fabian also advises that investors stay away from debt issued by Michigan and be wary of Connecticut, which, like New Jersey, has large unfunded pension liabilities. Kotok advises that investors who own muni mutual funds or ETFs check on exactly what those funds hold. Even if they don’t own, say, Puerto Rican debt, they may still come under pressure if the parent companies need to sell assets from other funds in order to meet redemptions. As of the latest data through June 30, more than half of the 579 municipal bond funds in Morningstar’s database own Puerto Rican debt. The biggest holders are Franklin Double Tax-Free Income (FPRTX), with 41% of assets invested in Puerto Rican debt, and the Oppenheimer Rochester series of municipal bond funds. Puerto Rican debt accounted for anywhere from 15% to 33% of the funds in this series, as of June 30, and the majority of the funds are investment-grade, single-state funds. They own Puerto Rican debt because it is triple tax-exempt, meaning that interest on the debt is exempt from federal, state and local income taxes. Investors who own individual muni bonds, rather than funds or ETFs, need to be especially careful because of the lack of diversification and transparency. The Securities and Exchange Commission recently hit Edward Jones with a $20 million fine for overcharging investors for the bonds sold to them and in June charged 36 municipal underwriting firms for fraudulent offerings. FINRA ordered UBS several times this year to repay millions of dollars to investors for losses they suffered as a result of being sold Puerto Rican bonds.